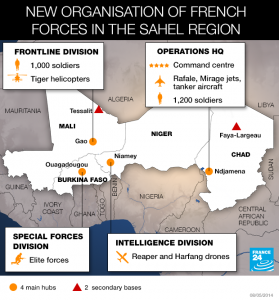 The following article, and a second one following with a map, reveal the depth of French commitment to training and ant-terrorism work in Mali, Burkina Faso, Niger, and Chad in addition to the 2,000 French troops in CAR. Now, the operation is increasingly characterized as an EU operation with, as noted below, Franco-German cooperation. These suggest how much the U.S. AFRICOM is relying on African and European troops for direct anti-terror training and operations while the U.S. relies on the CIA and SpecialOps for many more covert attack and training operations. “France and Germany have decided to send elements of the Franco-German Brigade to Mali: the first deployment under the aegis of the EU and in an African location,” a joint statement said following a security and defence meeting in Paris between the two countries. The brigade is highly symbolic in nature, as it is difficult for both countries to deploy soldiers to hotspots jointly, given the different rules of engagement that govern each army. The Islamists took control of northern Mali, ruling it under a brutal vision of Islamic law until former colonial ruler France sent in troops to flush them out in January 2013. But the rebels are regrouping in the desert and remain an ever-present threat to security. France is winding down its deployment from a peak of around 5,000 soldiers but will keep 1,000 troops in Mali beyond the northern spring. France’s military has unveiled its new blueprint for fighting extremist groups in the remote and often lawless Sahel region of Africa. FRANCE 24 pinpoints the key launch pads for future operations. Defence Minister Jean-Yves Le Drian said Thursday that France’s military was moving into a new “counter-terrorism” phase of its military intervention in Mali, known as Operation Serval, and will reorganise its troops and materiel in the wider region that includes Burkina Faso, Niger and Chad. This French operation was supported by the US Army sector of AFRICOM in planning, intelligence, and logistics via Operation Juniper Micron using planes from Scott AFB in Illinois and army support from Camp Darby in central Italy to transport French troops from their base in Istres (Provence) to Mali. “Around 3,000 soldiers will remain in the expansive area of Africa to check Islamist violence and arms trafficking, with no specified exit date,” Le Drian said. French forces will be organised around four base camps, each with its own focus, and with headquarters based in the Chadian capital of Ndjamena. This map does not identify Ivory Coast as the base entry portal for these French anti-terrorism forces as noted in previous press releases.